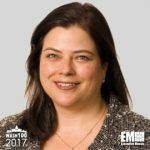 Executive Mosaic is honored to introduce Anita Antenucci, a senior managing director at Houlihan Lokey, as the newest inductee into the Wash100 — Executive Mosaic’s annual selection of influential leaders in the government contracting arena. She works from the investment bank’s office in Washington and concentrates on merger-and-acquisition and financing transactions in the aerospace, defense and government services sectors. Houlihan Lokey also provided a financial opinion on the spinoff of Computer Sciences Corp.’s then-U.S. public sector business and subsequent merger with SRA International to form the company now known as CSRA. Throughout her career, she has advised multiple companies, government agencies and investor groups regarding the potential impacts of acquisition reform and business restructuring on organizations. Antenucci served as co-president of the boutique investment bank formerly called Quarterdeck Investment Partners for nearly nine years before she joined Houlihan Lokey in October 2002. She is also a current member of the board of the Space Foundation and the National Guard Youth Foundation as well as the executive committee of the Shakespeare Theatre Co.‘s board of trustees. Executive Mosaic congratulates Anita Antenucci and the Houlihan Lokey team for their selection to receive this award.